There are so many pastimes concerning the cows. 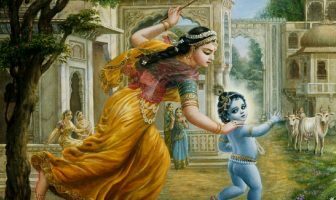 Krsna’s name is Govinda. Krsna was protecting the cows and calling the cows. 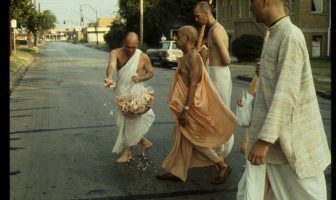 Yesterday, we were hearing from Gopiparanadhana Prabhu who was explaining that in the Govardhan pastime, at the end of the Govardhan Lila, at one point, Indra came before Krsna to beg pardon. 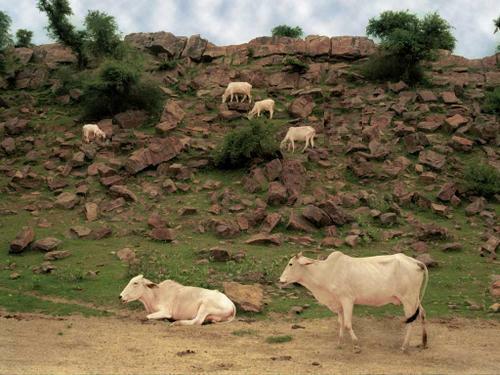 At that time, he was afraid so he did not come alone but brought Surabhi, the wish fulfilling cow, along as well. Surabhi prayed to Krsna and she desired that Krsna would become their Indra – not the demigod Indra, after all the name Indra is a post rather than a personality. Surabhi wanted Krsna to become the Indra because he is the real maintainer therefore she wanted to crown Krsna as Indra or the king of the universe. Therefore she started bathing him with milk and Indra was forced to go along with it, although it hurt him to crown Krsna as the Indra of the universe. He ordered his elephant Airavata to also start bathing Krsna with water from the heavenly Ganges, named Alakananda. Within the Sanskrit verse it says, ‘Indra gava,’ so Gopiparanadhana Prabhu explained that Indra gava is from the original word Govinda. He said gava and Indra becomes gavindra which then becomes Govinda.